Our CNC machining capability allows us to perform a broad number of manufacturing functions in the fabrication of complex glass and crystal components. This includes the unique capability for polishing internal and external features and other complex components. 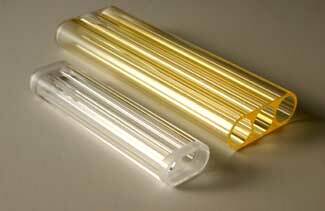 Laser cavity flow tubes, light pipes, cylindrical shapes from glass or crystal are a few of the products produced in the CNC center.